i've recorded last lightning on 20 December....after that date only false signals. Is it possible an assembly error? ....and last one. Is there a possibility to erase the interference in the white circle? The "Big Ugly Noise" just started on "Green" USB6.8. I went for a little stroll on the sidewalk. I noticed my next door neighbor on the north side watching his big screen TV. As I passed the same end of his house as the TV, the buzz heard on the WR3 VLF receiver got really strong. I will have to ask him sometime if it is a plasma, but I bet that it is. This neighbor is closest to the "Green" detector's antennas. I just received one of these VLF receivers from Stephen P. McGreevy. It is really sensitive, there are all kinds of noises in the house that I pick up with it. Since this is the same "band of interest" as Blitzortung, I think that it will be more effective than the Cornet meter or the AM radio. I also found a reasonably quiet area in the driveway that I could hear the lightning off of the East Coast yesterday and again this morning. I tried un-checking the "Flash Prefetch" Option under the "System Settings". This seems to have lowered my noise floor from the 20-30+mV range to 10 -<20mV. My "relative gain" has increased after running a while this way. So far, I haven't noticed a deterioration in response to the web interface or other performance issues. I'd also thought very little EMI was due to E field, inferring mostly H interference. (If you know any Paranormal Ghosthunters, this is one model "they use to detect ghosts". I detected zero E field anywhere near or in the area, unless the wife starts the older Nissan. Fired up the weedwacker for fun, and it spiked the Electrical also... . But I've got H literally out the Ying-Yang, as I suspected. 60Hz, and harmonics, oddballs, heterodynes, Pulses, and Sines, etc..
my antennas are sitting in the center of a 0.7 - 1.0 milligauss spot, about 4' square. 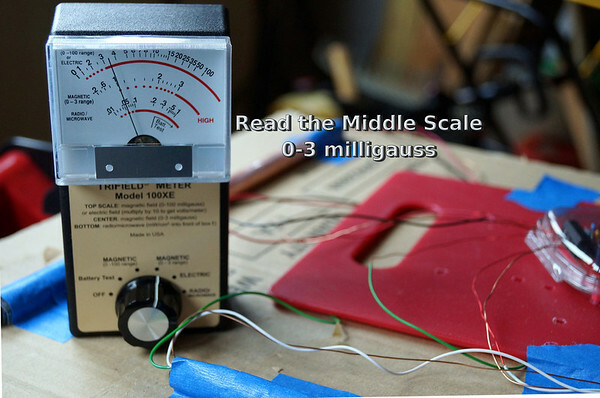 Any other areas exceed 1.0milligauss. No RF detected, and no E noticeable, at the times observed. relocating there should make a significant difference... at least on noise baseline. and experimenting with various locations for the Antennas... .
Also explains why shielding my 300mm X 7.5mm ferrite antennas made little or no difference in overall baseline noise. I do know that shielding decreased my ability to identify certain vehicles which drive by on a regular schedule. second sweet spot unhaunted.... hmmm...What about a "Shielded, Tightly Wound, Ferrite Cored Exorcist"? Nice thread! Thanks for starting it. I found a way to reduce the amount of LOOP connection errors to my Davis Advantage VUE Console reported from my weewx software running on PC. Replaced the included telco interface cable between the console and PC with a shielded serial cable. This reduced the run length of the telco cable by just a few inches. Just long enough to plug into console data logger pigtail and the supplied RJ4 to DB9 adapter. The weewx software handles these LOOP connection errors really well, but wanted to reduce them just the same. I thought I'd cross-post from blitzortung.org, since this fits the thread and may help some others. I just discovered a significant source of noise pickup that I had overlooked. I installed a stereo jack on my amp to plug into an audio amp for monitoring the output of the Red amp for noise. I generally keep a 6 foot audio patch cable connected between the Red amp output test pins and a small audio headphone amp I built, for easy monitoring. I tried unplugging the cable from the Red amp at the jack, and my weird sine wave noise and DC blower motor interference vanished! It was being back-coupled through the audio cable to the OUTPUT of the Red amp. Duh. I should have thought of that! The auto noise adjust feature is now much more stable and not kicking down the gains every time the furnace cycles. Easy fix...just connect the cable only when I want to monitor! After I pulled that audio cable, set my manual threshold 1 notch above the manual sweet spot (now 16x8 on both channels, set the thresholds to the default 120 mv, re-enabled auto noise floor and my detection ratios shot right up. However, there is still a small residual signal that seems to come on as the DC ECM furnace blower motor comes on with a call for heat from the thermostat. It is worse as the motor slowly ramps up to its normal operating speed from its low constant-on speed. At a steady speed, the interference is almost completely gone. I keep the motor running continuously between heating calls for better air exchange, filtering, and more even temperatures in the house. It's one of the reasons I installed the motor last fall. From what I can tell by the period of the interference, the frequency is in the 40 KHz region. Greg, your comment on the clamp-on ferrite RFI filter got me thinking. I did a search for any RFI information relating to ECM motors. I found the following in an RFI elimination bulletin from GE, the manufacturer of my motor (an "Evergreen" retrofit unit). thermostat lines to ground will reduce EMI. contact between all cabinet panels. Since I had already made sure the motor ground was correctly bonded to the furnace cabinet and had a good ground from the cabinet to a cold water pipe, I started thinking that the thermostat cabling in the house might be coupling noise from the motor control leads (which connect directly to the thermostat wires on this motor) out of the cabinet and radiating from the run to the new Honeywell thermostat I recently installed. I had one of the RFI snap-on ferrite filters I had used for ham-radio applications. I opened the furnace cabinet and wrapped the excess length of the thermostat cable bundle around the core three times. I found this completely eliminated the 40 KHz noise (likely the PWM switching frequency of the motor). I'm seeing far fewer noise threshold adjustment of the Red controller with auto-threshold turned on. I very occasionally see this really high-frequency, low amplitude noise burst riding on a normal lightning signal. It's inconsequential as a noise source to the detector as the amplitude is so low, but I have often wondered what might be the source. It reminds me of the colorburst signal that rides on an NTSC composite color video signal. Yeah... one of them weirdo front porch references, however! Must be a Weather Channel signal... . I see a very similar trace every once in a while too. Although mine normally shows up just prior the main pulse. So far, I haven't been able to isolate it to anything local. Will try to capture a trace if I see it again. I wonder if it's an X-10 remote control signal? I have an alarm system that uses X-10 to trigger remote sirens, lights etc. I don't use any of them, but I recall I had the console set up to send turn-on signals for sirens and lights. I think X-10 runs on a carrier at 120 KHz. Has anyone observed a noise source like this? While monitoring the noise on the Red controller scope, it manifests as a slow-moving "wave" that moves slowly across the screen from left to right. It only shows up when my ECM variable speed motor controller is running, and is predominant on channel 1 (red trace). I think this may be harmonic distortion being introduced onto the AC line by the motor, which in turn radiates it through the power lines, where it is picked up by the antennas. Sometimes the noise will cause an increase in the noise threshold which causes the auto-noise adjust feature to increase the threshold for a few seconds until it passes off the screen. Other times the threshold adjust algorithm ignores it and it manifests as an increase in false detections at a low rate until it passes. I tried monitoring the AC line on my oscilloscope. I occasionally see a brief phase "shudder" (scope false-syncing on noise?) on the sine wave when the motor is running. The sine wave is very slightly asymmetrical, but that is constant. Great info, thanks! It seems to discuss exactly the issue I'm seeing. I did try wrapping the power leads in the furnace cabinet to the motor inside another snap-on ferrite RFI choke. The leads are quite thick (1 HP, 120 VAC motor), but I managed to get two loops of the hot and neutral leads through the core. It seems to have helped the common-mode noise some. It may not be that effective at the frequencies involved, as it is designed for higher RF frequencies. The same ferrite worked really well keeping ham VHF interference out of a high-current linear power supply. I'm not sure if the issue is actually RF interference. I think the pulsed nature of the current draw of the ECM motor is creating harmonic distortion on the power line, distorting the AC waveform. This is a low-frequency phenomena. The classic fix is to throw a huge inductor in series with the hot lead(s) of the load to minimize the effects of the pulses of current drawn by the motor. Those things are really expensive. The issue isn't severe enough to justify that expense. However, if the issue is RF interference, the Corcom 20-amp filter mentioned in your link (and in the GE app note I mentioned earlier) might be worth a try. They're a bit pricey ($30.00 - $60.00) used/new. I might try it, though. It's a cost/benefit thing. Maybe GE has a free RF mitigation kit. In addition to getting a good ground installed on my system, I also cleaned up an intermittent noise issue I was having with a new ECM high-efficiency furnace blower I installed last fall. The new motor was causing harmonic distortion to be introduced back into the AC power on AC peaks because of the pulsed nature of the motor's current draw, compared to the smooth current draw of the old conventional PSC motor. Some of the harmonics were being radiated from the power wiring in the walls and fell within the passband of the receiver. They were being inductively coupled to the antenna, so the electrostatic shielding on the antennas wasn't helping. GE, the manufacturer of the motor, was nice enough to send me a power factor correction choke that is wired in series with the hot power lead to the motor. The choke provided immediate reduction of the harmonic distortion noise under most operating conditions of the motor. I was seeing the noise force a temporary but significant reduction in gain when the heating system was running. Nice write-up. Excellent documentation. I saved it for future reference. So...What do you think of this one? The dog's invisible fence. So how to minimize the effect? If you've confirmed it's the fence, you have a hard job/decision in your backpack! Especially since many of the frequencies and harmonics used are in the exact range we're trying to receive! (7-10K or similar). Arrrggghhh! One of our neighbors has one of those invisible fences for their dog. They used it for several months but have now turned it off after their dog learned not to go past a certain line in the yard. Have you tried turning it off and seeing if your dog stops before it gets to the fence line? Yes it is still needed. We have 2 Chiwawa dogs - Beth and Jake. When their batteries on the collar need replacing, Beth notices with in a few days and likes running up and down the street. Even with the fence turned on, she will also get a running head start and jump as she crosses the boundary if there is something she really wants to get. She lets out a little yelp and then keeps on going. When Jake's collar broke, it took him about 3 weeks to notice and he started chasing rabbits. He would be so focused and dedicated to catching the rabbit that he wouldn't notice he was 5 yards away and didn't know where home was. So the fence does keep them in the yard 99% of the time. before the days of electric fences, we clipped a leash from the clothesline to our Chihuahua's harness... he could run and play within restrictions of line.